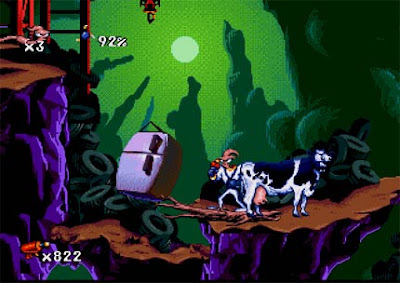 About a week ago I had the opportunity to replay Earthworm Jim. (For you young ‘uns out there, Earthworm Jim is a side-scrolling platform game released by Shiny Entertainment back in 1994.) Back in the day, when I was adorned with a stylish half-mullet and denim jacket, I rocked this game in a single weekend. Playing a week ago I was surprised to find two things: one, the humor and graphics for this title are still very enjoyable. Two, I had no ability to play it. I wasn’t too surprised at first; the gameplay for older games is notoriously difficult. Still, there was a time during my tenure as a gamer when I was able to overcome these challenges. Have I lost my touch? Have I become so dependent on modern controls that I no longer have the skills? I beat Mike Tyson’s Punch-out for god sake, I threaded the needle in the bike level in Battletoads, I delivered to the entire neighborhood in Paperboy (more examples here); I was a champion I tell you, one of the best. Can it be that at twenty six I have already passed my gaming prime? The sad answer is probably yes. But there is no denying that it is not only me that has changed, it’s the medium as well. While this is hardly a great revelation, I believe there are really two significant evolutions in gaming that separate the difficulty of modern games from the difficulty of classic games. Looking at the mind-blowing graphics in a game like Uncharted 2, it’s astonishing to think that there was a time, so recently, when video games looked nothing like real life. Backgrounds were repetitive tiles and the color pallet of the environments was very slim. Avatars and the objects and enemies they interacted with were bizarre, abstract representations. Determining what a given item was and how it functioned in many classic games required a Rorschach like analysis. What does this look like to you? A submarine? A lawnmower? A dog? Interesting, tell me about your mother. The trial and error factor in classic games was half the difficulty. Even when the identity and functions of given objects were determined in classic games, the overall clumsiness of early systems made success or failure a question of a few pixels. Rudimentary graphics made mistakes on the part of the player easier in the same way that rudimentary hand grenades made it easier to blow oneself up. In the classic side scrolling shooter Contra things are not so equitable. Enemy spawns are pre-set, but just random enough so that occasionally, in the constant flurry of bullets, fireballs, and pointy sticks your avatar will find themselves in a position where no amount jumping, ducking, or dodging will save you. Call it “extreme difficulty” if you want to, but I chalk up this kind of scenario to poor design. Newer games have embraced a gentler learning curve than the classic games that I grew up on. Games that introduce challenge steadily, allowing the player to adapt along with the gameplay, have become the gold standard of the modern age of gaming. A few games had this right from the start: most notably, Super Mario Bros. and other early Nintendo titles showed a very forward-thinking design aesthetic and learning curve. But for the most part, games beat us to a pulp and we liked it, because that’s the way it was. The classic games that I grew up on had many other limitations, but I would never slight their contribution to the medium. While I may have grown soft in my “old” age, I am continually impressed at how far interactive media has progressed. Programmers of classic games did the best they could with what they had, and while their games may be nearly impossible by today’s standards I do take a measure of pride that I got to play them in their heyday. I may not be able to tell my grandchildren that I fought in a great war or endured an economic depression (although we are pretty close), but I will be able to tell them that I was there at the very beginning of an artistic revolution.